Holy Saturday, also known as Holy and Great Saturday, the Great Sabbath, Joyous Saturday, Black Saturday, or Easter Even, is the day after Good Friday and before Easter. It commemorates the day when Jesus Christ’s body lay in the tomb and when Christ’s soul triumphantly descended into the underworld. Holy Saturday concludes Holy Week, commemorating the day after the crucifixion and before the resurrection of Jesus Christ. According to the Gospel accounts, Jesus’ body was taken from the cross and hurriedly buried in a cave tomb because a proper burial ceremony couldn’t be held on the Sabbath day. After his death, the soul of Jesus Christ descended into the realm of the dead, where he brought salvation to all of the righteous who had died since the beginning the world. In Christian theology, Christ’s descent into the underworld is referred to as the Harrowing of Hell. In the Catholic tradition, the liturgy of Holy Saturday does not include Mass. Exceptions are made for extremely grave or solemn situations with a dispensation from the local bishop or the Vatican. Daytime services or commemorations are rare in the Western liturgical tradition; Easter Vigil that begins after sundown on Holy Saturday is served on Easter Sunday from the liturgical point of view. During Holy Saturday, the chancel (the space around the alter) in Catholic churches is traditionally left uncovered. Altars in Anglican, Lutheran, and Methodist churches may be covered in black or adorned with black paraments instead of being stripped. Generally, these churches observe the same Holy Saturday customs as the Catholic Church. Some countries have specific traditions associated with Holy Saturday. 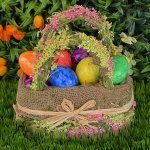 For example, one of the most beloved traditions in Poland is the blessing of Easter baskets called Święconka. Poles prepare baskets lined with white napkins, filled with Easter foods (eggs, bread, lamb, ham, horseradish, salt) and decorated with boxwood sprigs. Each item in the Easter baskets has a symbolic meaning. Eggs are a symbol of life and the resurrection of Jesus Christ; bread and lamb represent Jesus; salt is a symbol of purification; horseradish represents the bitter sacrifice of Jesus Christ; ham is a symbol of joy and abundance associated with the end of Lent and the feast of Easter. These baskets are brought to church to be blessed on Holy Saturday. There are elaborate prayers specifically addressing each type of food in the baskets. The priest or deacon then sprinkles the baskets with holy water. The food blessed in church is brought home but remains untouched until Sunday morning or afternoon. In the Philippines, where the majority of population are Roman Catholic, Holy Saturday is known as Black Saturday, referring to black as the color of mourning. Some traditional taboos from Good Friday are extended to Black Saturday, whereas others are lifted. For example, small enterprises remain closed until Easter, but bigger commercial establishments resume operation. Television or radio stations remain off-air or broadcast on shorter hours with religious-themed programming.